Salutes are pyrotechnic devices that explode with a loud report when ignited. They are fairly simple in function, and are therefore quite easy to make. However, they have caused many injuries over the years because some people had been fooling around with them, using them in ways they were not designed to be,and injuring themselves. Therefore,some stupid bureaucrats decided to make most salutes illegal. I do not agree with this law, because it restricts the freedom of the 98% of the users of salutes who used them responsibly. Yet another example of a situation where a few misguided individuals ruin the situation for everybody. I suggest you check your national and, if nessesary, state/provincial laws before attempting to make a salute. 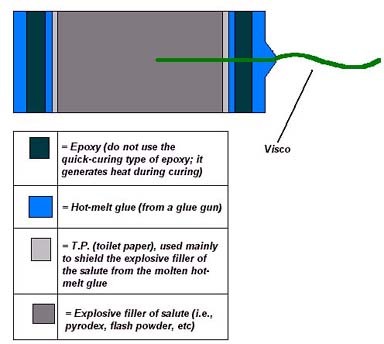 The materials needed to make an M-80 salute are: Visco fuse; A kraft paper tube, either spiral wound or convolute (dimensions: 3/4" inner diameter, 1" outer diameter, 2 1/2" length); A report composition (such as Black Powder, Pyrodex, Flash Powder, H3, etc. ; NOTE: Only use Flash Powders if you've had adequate experience with them); a Hot Glue Gun; some Kleenex or TP; and some Epoxy (optionally mixed with sawdust as a filler). First, the first end plug is formed. A piece of dowel is inserted into the tube until all but 1/2" at one end is obscured by the dowel. Place some TP over the dowel. The TP should just be big enough to block the sight of the dowel. Next, hot glue is added to 1/3rd of the remaining empty space at the end of the tube. Allow the Hot Glue to cure. Next, after the hot glue has solidified, add some mixed epoxy (or mixed epoxy with added sawdust filler) to the next 1/3rd of the space and allow it to cure. Then, fill the remaining space with more hot glue and allow it to cure. Now it is time to drill the fuse hole. Take a 1/8th" drill bit, and drill a hole slowly and carefully through the center of the end plug. Insert a length of Visco (I recommend you start off with relatively long lengths) through the hole in the end plug, until about 1" is visibly protruding from the endplug into the inside of the casing. Seal around the Visco with a bit of hot glue (don't worry; it won't ignite the Visco), and allow the glue to solidify. This will make the salute more resistent to wear, and will waterproof the salute. Next, take your report composition (BP, Mag55 Flash, Standard 70/30 KClO4/Al flash, Pyrodex, etc. ), and fill the salute tube with it, until all but 1/2" at the open end of the tube is obscured by the report composition. Then, take a piece of TP and place it over the composition, and proceed to make an endplug the same way as is stated above (but do not drill another fuse hole ;-). When the last end plug sets, you have finished making quite a formidable M-80 -type salute, which will blow you away when you set it off. Here's a nostalgia-creating warning: WARNING: Explosive. Never Hold Salute in Hand When Lighting Fuse. Place on Ground, Light Fuse, and Retire. Etc., etc., etc. ;-) Here is a schematic of an M-80 -type salute. The Desert Blast website also has a page with a pictorial step by step guide to making almost replica-quality M-80s. Suggested reading. Cherry Bombs are usually the most fondly remembered thing from a pyro's childhood. The pleasing shape, the marvelous ->|BANG|<-, the complaints of neighbours ;-)... Almost enough to pitch me into a fit of nostalgia. Unfortunately, public access to these little wonders was cut short around ~1965 due to government legislation. However, provided the proper liscencing, almost anyone can legally make a cherry bomb. Here's how to do it if you don't have access to the proper cupsets. For this project, you must obtain the following: (I) a package of ping pong balls; (II) waterglass (sodium silicate) solution (NC lacquer can be substituted for the waterglass but it presents more of a fire hazard, and kinda softens the ping pong balls due to the fact that ping pong balls are, in fact, made of nitrocellulose plastic); (III) cherry-red water-soluble clothing dye; (IV) Visco fuse or similar; (V) Hot glue and a hot glue gun; (VI) Sawdust or wood meal; (VII) a report composition such as flash powder, whistle mix, etc. First, sand the ping pong ball lightly with rough grit sandpaper until it has aquired a rough surface. Then, drill a 1/8th" hole (yes, drill, poking splits the ping pong ball) into the ping pong ball. Funnel all of the report composition you can into the ping pong ball via this hole (using a thin copper wire to help the flow of the report comp helps here). Then, insert a length of Visco into the hole and seal around the Visco with hot glue (wiping the excess off with your finger, thereby making a smooth seal). Next, dissolve the red dye in some warm water and add the solution to the sawdust, and allow it to dry. The sawdust should now be a nice cherry red colour. Then, mix some of the dry sawdust in with your waterglass solution until it is coloured a nice cherry red and has about the consistency of oatmeal. Dip the ping pong ball (but not the fuse!) into this waterglass/sawdust slurry, and allow the waterglass to harden well. Then, apply a thin final coat of waterglass/sawdust slurry with a paintbrush, and then dust some red sawdust evenly over the ping pong ball (it will adhere to the final waterglass/sawdust slurry coating), and allow the waterglass to cure for two days before using. Have fun! 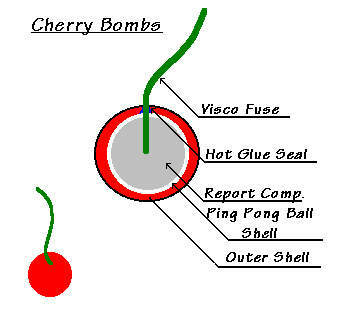 Here is a schematic of a Cherry Bomb. The Desert Blast website also has a page with a pictorial step by step guide to making almost replica-quality cherry bombs. Also suggested reading.